They have staked their claim as iconic. Film stars of Humphrey Bogart’s generation wore them on the big screen. Light on the pate and good cover under the blazing tropical sun Panama Hats have never fallen out of fashion. You’ll see them for sale throughout Panama and worn all over the world in obliging climates. 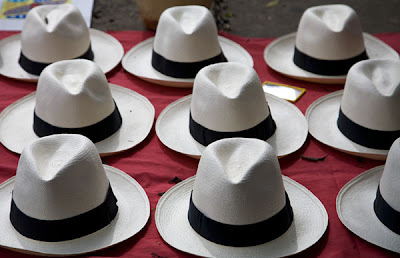 But here’s the truth: Panama Hats are not made in Panama. The indigenous people of Ecuador weave them from the leaves of a palm plant, the Toquilla. An isthmus between the Atlantic Ocean and the Caribbean the Republic of Panama has seen a lot of traffic from explorers, traders and plunderers throughout the ages. And savvy Ecuadorian traders have been exporting their goods to Panama for centuries. Business boomed during the gold rush of the 1800s as many passed through Panama to seek their fortunes in the heat of the Californian sun. The U.S. government bought tens of thousands of Panama Hats from dealers in Panama City for the troops during the Spanish American War. I love Panama (from Ecuador) hats, especially ones with huge brims. I think you hit the nail on the head: they're definitely stylish, yet functional. Thanks for the brief history lesson. When I went to Ecuador, I didn't make it to the town in the South where they make the hats, but guess what all my male relatives got for Christmas last year? I love stories like this, history gets so twisted! I have worn a version of the Panama hat for years and now I'm glad to know the real story behind it! Yeah, history or rather geography twisted alright. Like the Polka dance that is Czech not Polish. Lakshmi, you crack me up! Fly Girl, What a cool accessory. Koala, now I know the truth about the Polka. Tis very funny what a "small world" it can be. E-mail me any time.